Om Cafe is located on Woodward Ave in the heart of Downtown Ferndale. Om Cafe planted it’s roots in 1985 and has been serving organic food free of growth hormones and antibiotics ever since. I have been wanting to try out Om Cafe for a while. I follow them on Facebook and drool over the delicious shots of vegan/vegetarian dishes. Emily’s friend was visiting from out of town and is a vegetarian so I suggested Om Cafe. You can imagine my disappointment when we stopped in for brunch a couple weeks ago and received terrible service. First, let me explain. There were four of us total and we waited for about seven minutes after we were sat. It wasn’t busy, maybe four tables total including us. We watched as employees continued to walk by us, not one stopping to greet us or take our drink order. I finally asked a woman who was busing a table a few down if she was our server. She said she wasn’t with an annoyed tone. I asked her if she could get our server since she didn’t offer and then she walked away. A few moments later another woman came over and asked if we were ready to order. There was no “Hi, how are you?” No, “sorry about that.” Nothing. We ordered and our food came out pretty quickly, and after that service was OK. However, Seven minutes is a long time to wait when the whole restaurant is as big as a large living room and you are sitting there twidaling your thumbs, hungry while you watch employee after employee walk right by you when all you want is someone to acknowledge you. I was really excited about this place and talked it up to my friends only to be let down and embarrassed. Breakfast Nachos: Organic corn chips topped with tofu black bean scramble, roasted potatoes, spicy cashew nacho cheese sauce, guacamole and cilantro, served with salsa. I was skeptical and also intrigued by the spicy cashew nacho cheese. This stuff was the bomb.com! I couldn’t believe it was vegan and healthy! I am the type of girl that has seriously contemplated bathing in nacho cheese because I love it that much. I also know that its awful for me, but here I found a healthy vegan version? Shut the front door! Knowing this dish was good for me made it taste even better. The guacamole and salsa were fresh with robust flavors. The tofu black bean scramble was earthy, yet tasty. Cauliflower Tostada: Crispy corn tortillas topped with seasoned pinto beans, fresh lettuce, seasoned cauliflower crumbles, and a green chili/cilantro/avocado sauce served with chips and salsa. Not as good as the breakfast nachos, but still decent. There was missing something, so I asked for a side of the cashew nacho cheese and this instantly made this dish better. I added a fried egg as well and the yolk was a nice silky addition. The roasted cauliflower was tender, not mushy and almost had a nutty flavor. The green chili/cilantro/avocado sauce was spicy and creamy, but I wish there were more of it. This dish was a little dry before I added the cashew nacho cheese. Tofu Scramble: Tofu scramble with black beans, broccoli, carrot, garlic, onion, tossed with roasted redskin potatoes and kale. Served with rye toast. Hearty, flavorful, and busy in a good way. The veggies were fresh and still had some texture. Cornbread, Eggs, and Sausage Bowl: Sautéed veggie sausage with crumbled cornbread and scrambled organic eggs mixed throughout, with tabasco, topped with fresh red bell pepper and scallion. This dish gave me a nice “meat & potatoes” feel. I liked that it was simple, yet included enough ingredients to satisfy the average appetite. The food was really good, but sadly I will not return because of the poor customer service. Another bummer is that they do not serve alcohol. What is brunch without a mimosa or Bloody Mary!? Seriously guys, customer service is super important in any industry. Step it up! Ima, located on Michigan Ave, just a hop, skip, and a jump away from Motor City Wine, opened its doors in late December of last year. Chef Michael Ransom’s Michigan roots and his passion for Japanese comfort food and is what started the udon (thick wheat flour noodle served hot in soup) themed restaurant. The space is small, but is full of big flavors. With a seasonal menu offering a variety of noodle soups including Spicy Pork Udon and rice bowls like the Golden Curry, Ima brings together Japanese cuisine with home cooked feel good food. Steamed edamame: Chilis, lemon, olive oil, sea salt. I really liked the bright, spicy, seasonings. This normally yummy snack was amped up with flavor. I couldn’t get enough. Unagi-don Rice Bowl: BBQ glazed eel, pickled cucumber, slaw, pickled ginger, radish sprout. I am a huge eel sushi fan so when I saw this on the menu, I had to order it. I was worried that the eel would be fatty and when it came out, my suspicions were confirmed. This required me to put in a little work, but once I did, it was slightly sweet from the eel sauce and satisfactory. The pickled veggies were slightly acidic, but cut through the rich eel. I added a fried egg and boy, am I glad I did. The yolk created a sauce that added a bright color to the rice bowl. Golden Curry Rice Bowl: Silky curry sauce, root veggies, ginger pickle, soft boiled egg. When I spotted the bok choy, I was thrilled because it’s one of my favorite vegetables, but I don’t get to eat it too often. The curry flavor was bold, without being overwhelmingly spicy. The scallions added a mild onion flavor and a nice bright crunch. Spicy Pork Udon: Toasted chili broth, smoked pork loin, soft boiled egg, garlic oil. This bowl brings the heat! The pork was tender, juicy, and sliced thin. The broth was seriously spicy with a hint of smoky. It was almost hard to eat because of how hot it was, but the broth had good flavor. This would’ve been better if they toned it down just a tad. Curry Udon: Silky curry broth, soft egg, ginger pickle. Be prepared, because you will definitely slurp with this bowl! I recommend cutting the noodles into smaller pieces to make eating this less messy. The curry broth was savory, subtle. and not super spicy which I liked. The ginger pickle added texture and the sour flavor complimented the curry. Service was really good and I was impressed with how accommodating and friendly the staff was. The tables are set up as shared seating which I always like because I get a good view at what my neighbors are enjoying. If you know me, I hate menu’s because I can never decide. I want it all! So being able to see the options in the flesh helps me make a dinner decision. I was bummed out that Ima doesn’t serve alcoholic beverages, but hopefully they will have their liquor license soon. I will definitely be back to try the Ima tacos and Mexican Coke. Ima offers gluten free, vegetarian, and vegan options. Join Ima for dinner, they are open Tuesday-Saturday, 5pm-10pm. Thanks for an awesome time, ladies! Can’t wait for our next adventure. Townhouse’s Detroit location lies on Woodward Ave in the heart of Downtown, across from Campus Martius. Townhouse offers a massive Whiskey and Bourbon menu as well as an array of different small plates that are reasonably priced. I recommend dining in the “glass house” because the natural light will pour through and illuminate your experience. If you want drinks, grab a seat at the bar. The menu is all over the place and there is no theme, but I like this. You can find pizza, salads, burgers, sushi, and also some unique dishes such as Elk Tenderloin, Braised Short Ribs, and Butternut Squash Pizza. Sweet Corn Chowder: House Chorizo, Pumpkin Seeds (pepitas), Cilantro, Lime. The chorizo had a subtle spicy flavor without being greasy or heavy. The chowder had a smooth, silky texture which complimented the crunchy pepitas nicely. Brussel Sprouts: Balsamic Brown Butter, Parmesan, Pistachio. Since I love pistachios, I couldn’t pass up this dish. I liked that the Brussel Sprouts were tender on the inside, yet crispy and caramelized on the outside, but they were a little overcooked for my liking. The Parmesan adds a nice salty flavor which paired well with the balsamic. Shrimp Tempura Verde Roll: Crab, Granny Smith Apple, Japanese Salsa Verde, Cilantro Crystals. If you know me, you know that I love verde sauce. So much, in fact, that I often request it at my late night Taco Bell visits even though I know they don’t carry it. Ridiculous, I know, but I just have hope that one time I will ask and they will have a different answer. Fun Fact: Verde sauce is a regional TB menu item. You can imagine how excited I was when I was in Arizona a couple months ago and was rewarded verde sauce. I asked for my favorite condiment as I usually do ready to be disappointed yet again, only to be told that not only did this Taco Bell have it, but they actually make it fresh. Score! Anyways, back to this sushi roll. This verde sauce was on point. Fresh, slightly acidic and tart, adding a nice brightness to the crunchy tempura. The Granny Smith apple was a nice addition and added a sweet texture. I didn’t taste the crystalized cilantro, but since it can be overpowering, this was a good thing. Chicken Meatballs: Tomato Sugo, Parmigiano Reggiano, Basil. I liked that these meatballs were a change from the usual beef meatball. They were light and I didn’t feel bad eating them. The sauce was decent, slightly sweet, with a hint of heat. I also appreciated that there was enough sauce for each bite of meatball. The meatball itself could’ve used more seasoning. Service was good and the restaurant gave off good vibes. Townhouse offers Happy Hour and daily dinner specials. I didn’t save room for dessert, but I had my eye on the Hot Chocolate Creme Brûlée and the Fried Bread Pudding. I will definitely be back to taste dessert and eat my way through the sushi menu. Shout out to Chris for a fun night! Thanks for sharing with me. Ocean Prime is an upscale dining destination specializing in prime seafood and steaks. I was invited to taste their Happy Hour menu this past week including appetizers, small plates, and cocktail specials. With an emphasis on presentation and detail, Ocean Prime sets to create remarkable dining experiences. Their “smoking” displays (getting creative with dry ice) really exhibit the dedication and passion to wow their guests. Ocean Prime offers a menu featuring American dishes done with modern, sophisticated execution including White Truffle Cavier Deviled Eggs and Duroc Pork Chops. Berries and Bubbles: Belvedere Citrus, Crème de Cassis, House made sour, Domaine Chandon Brut, Grand Marnier marinated berries. A little sour meets slight fruity fizz. Pretty cool! This drink is made with dry ice which gave it a smoky, bubbling effect. Tuna Tartare: Ahi tuna, chilled, diced, and tossed in soy sauce, sesame oil, sriracha, stacked as a tower with avocado tossed in lime juice, wasabi drizzle, and fried wontons in ginger ponzu sauce. Garnished with sour cream, pickled ginger, toasted sesame seeds, scallions. Light, refreshing, with a touch of heat. With each bite, you got a nuttiness from the sesame seeds and a crunch from the fried wontons. The sweet, citrus ponzu sauce was a nice addition and the tuna melted in your mouth. Somerset Roll: (Pictured on left). Tempura Shrimp, Cream Cheese, Scallion, Beef Carpaccio (pounded thin and served raw). The beef carpaccio was a unique twist and it worked. The cream cheese added a slight tang that went well with the sweet sauce. Tuna Roll (Pictured on right). Spicy tuna, avocado, cucumber. I was a little disappointed there wasn’t more to this roll. I liked that the tuna was on top, but it was pretty basic. I can get a spicy tuna roll like this anywhere. Shrimp Saute: Jumbo shrimp sautéed in white wine garlic sauce, Tabasco, & grape tomatoes. Served with sourdough crostini with aged Swiss and Provolone cheeses gratineed on top and garnished with minced chives. I am not sure I understood the idea behind this dish and how the ingredients fit together. The Tabasco cream sauce was tasty with subtle heat, and the shrimp was fresh and succulent. However, the crostini was so soggy from the cheese and sauce, that when I first tried it, I thought it was just a piece of fried cheese. It tasted good, but the cheese was heavy and it was hard to distinguish what it was until we asked our server. It would have been better with a more substantial piece of bread like a baguette with a light dusting of cheese added right before it was served. Point Judith Calamari: Fried and tossed with hoison, soy, and sweet Thai chili sauces with carrots, red peppers, bean sprouts, candied cashews, snap peas and scallions. The sauce was sweet, slightly spicy, thick, and tacky, and really adhered to the lightly fried calamari. The calamari was still crispy despite being dressed with a generous amount of sauce. The garnish of veggies and candied cashews added a fresh, crunchy texture. Lamb Lollipops: Teriyaki marinated Australian lamb rib chops. Frenched (exposed ribs), roasted, seared, and glazed with Teriyaki marinade reduction on a bed of soy butter sauce. The lamb was heavily seasoned which was appreciated, but it was overcooked (served well done) and a little dry. I liked the soy butter sauce. It was salty, rich, with a nice sweetness to finish it off. Butter Cake: House-made warm, golden butter cake, with fresh berries, vanilla ice cream, served with a house-made raspberry sauce. This dessert took me back to my childhood when I used to eat butter cookies with my grandma. It was warm, simple, yet complex with the different layers of flavor. First, you tasted the warm, sweet, cake, then the fresh berries, creamy cool vanilla ice cream, and it was completed with a tart raspberry sauce. In one spoonful, I scored a crispy, crunchy edge of the cake which almost had a caramelized element to it. The “smoking” presentation included in dishes such as the Shellfish Tower, Shrimp Cocktail and the Berries and Bubbles cocktail is creative and theatrical. Overall, you can taste the quality and feel the effort put forth in each dish at Ocean Prime. Service was above average and the staff knows their stuff when it comes to the menu and recommendations. Be sure to take advantage of Ocean Prime’s Happy Hour happening weekdays from 4-7 PM which includes $5 off cocktails and sushi rolls, and specially priced appetizers and small plates. Join Ocean Prime for an Easter Brunch Sunday, April 16th beginning at 11 AM featuring Blood Orange Mimosa, Smoked Salmon, Crab & Eggs, Braised Short Rib Surf and Turf, and more! Surf & Turf Sundays: 2 courses featuring an 8 oz filet with your choice of Sea Scallops, Crab Cakes, or Shrimp Scampi for $55/person. Select bottles of wine for half priced. The third addition to the Inlaws Hospitality group (Green Dot Stables and Johnny Noodle King) is Detroit’s Huron Room. We are coming up on the 1 year anniversary of the restaurant (doors opened Mother’s Day 2016), so I thought it was a good time to feature the Great Lakes inspired joint. Expect to find a new and improved menu full of creative seafood dishes (crab louie salad, lobster and crab nachos), burgers, and some serious comfort food (Pot Roast, City Chicken, BLT). I love that Huron Room offers Michigan made beer and wine, as well as liquor for their craft cocktails. At one point, their menus were actually printed on pieces of thin wood that smelled amazing. Clobster Stadium Nachos: Crab, lobster, cheese sauce, house pepper, chives. A nice combo of huge chunks of rich seafood, spicy peppers, and creamy, salty cheese sauce. The chips came out piping hot, extra thick and crunchy. You could tell they were house made. The perfect tool for scooping the delicious toppings into my mouth. A very nice spin on classic nachos. Hush Puppies: pimento cheese, house peppers, chives. I am a sucker for hush puppies so when I found these on the menu I was ecstatic. The crispy cornmeal crust was golden brown and filled with a creamy, spicy filling. The sauce was so delicious that I found myself ladling it in my mouth with my fork. I was sweet, creamy, and added a coolness to the spicy peppers. You can’t beat it for $6! Fish Sandwich (special): Cod burger topped with lettuce, red onion, and tomato. The fish was juicy, but this sandwich wasn’t my favorite. It was good, but I would’ve liked a little more seasoning and spice. I did like that this was light and didn’t leave me feeling heavy like most burgers do. This Great Lakes space decided to revamp their menu a couple months ago and take a different spin on things. Now you can find more than just seafood as well as lower prices. Service is always good and they offer happy hour and a brunch menu (featuring Corn Beef Hash and a Monte Crisco). If you haven’t tried Huron Room, stop in and see for yourself. Taco Salad: Tequila lime chicken, corn salasa, pico de gallo, guacamole, lettuce, black beans, cojita cheese, spicy queso, and sour cream. This is usually my go to because I can go crazy with all the toppings. Fresh, light, and delicious! Totally satisfying and I didn’t feel bad eating it because of all the veggies. The spicy queso packed the heat and I liked that could taste all the different peppers. Qdoba is one of the few chain/fast food spots that I enjoy. I really like that you can load up on a ton of veggies and customize your order. They are constantly offering new and exciting menu items and switching things up. Check it out! 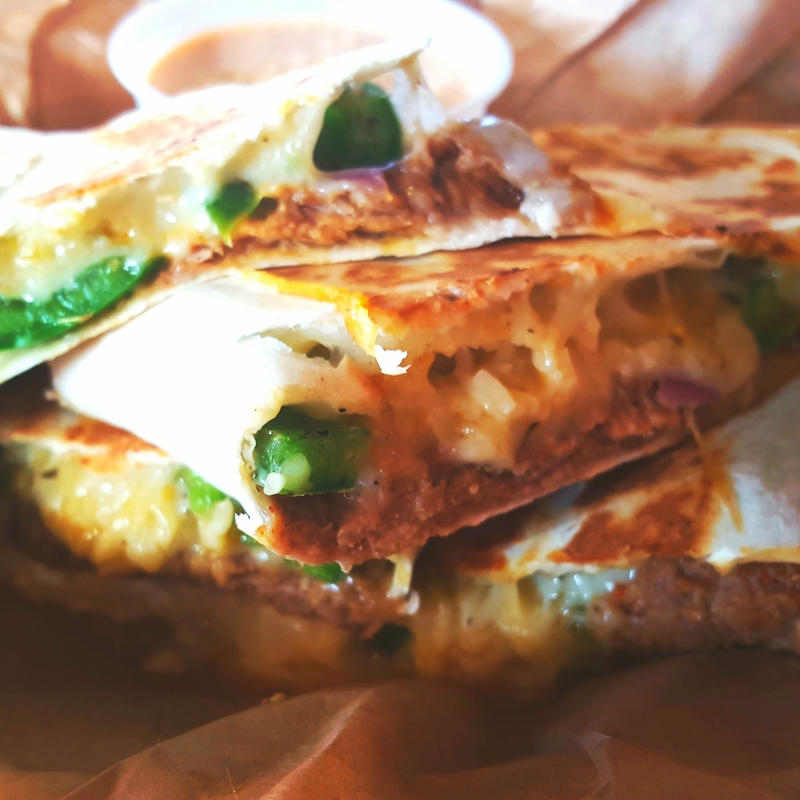 Steak Quesadilla: Loaded with sauteed red onions, green peppers, cheese. The steak was tender and flavorful. Salty, spicy, but not overwhelming. Perfect ratio of cheese, veggies, and protein. The green peppers still had a bite to them, but were slightly sauteed. I hate when veggies have been cooked to death that they are so limp and lifeless. Gladiator: Grilled steak, bacon, pico de gallo, lettuce, Mexican caesar dressing, cilantro and cotija cheese. The bacon was salty and paired well with the tender steak. I really liked the Mexican Caesar dressing. It was creamy, tangy, with a little kick. Two timer: Pulled pork, salsa roja, shredded cheese, lettuce, pico de gallo and cotija cheese in a crispy taco, wrapped in a flour tortilla spread with 3-cheese Queso. The queso acted as glue for the second tortilla. It had a “cheesy gordita crunch” vibe, but only better because it was queso! The pulled pork was juicy and the cojita cheese added a hint of salt. The veggies were fresh and balanced out the whole taco. The only thing I didn’t like was that halfway thru, the tortilla started to fall apart so I ended up fork and knifing it. My favorite thing about Qdoba is the selection of queso. At any given time, they offer around 3 different types of queso to choose from. The current promo is beer cheese queso and I can’t wait to try it! 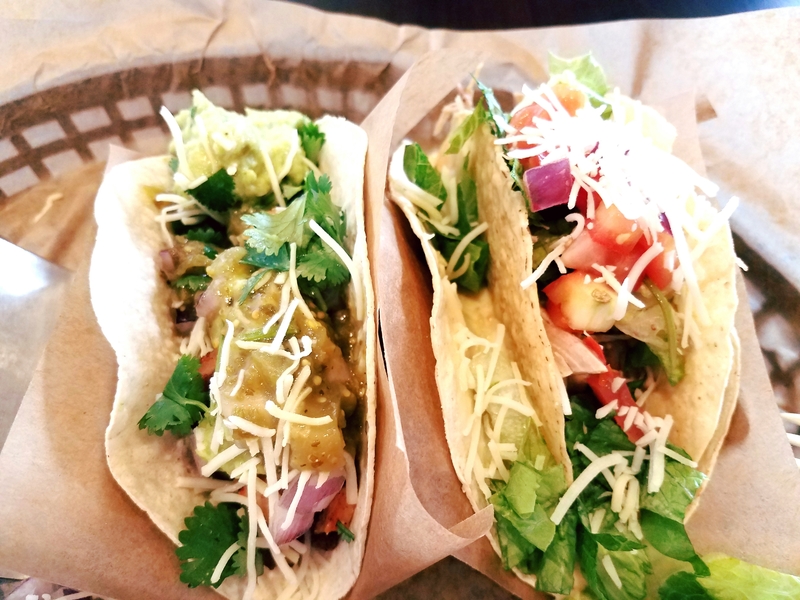 Each location offers different seasonal items, so be sure to check with your local Qdoba. Shout out to Sonya at the Northville location. Thanks for the opportunity to try out so many delicious items! Located on Michigan Ave in Detroit’s historic Corktown, Katoi opened its doors in March 2016 and has been the hottest new spot ever since. Currently it is being considered as Best New Restaurant for 2017 James Beard Awards and I am convinced when the winners are announced in March, Katoi will be awarded the honors. Diners expect an “out of this world” experience. The flavors are on a whole other planet and this is what the restaurant is centered around. The mother ship has landed and it brings bold and intense tastes! Thrice Cooked Sweet Potatoes: Palm sugar, sherry, cilantro, topped with crispy shallots and served on a bed of avocado cream sauce. Insane! The outside of the potato was crispy, yet the inside was tender and creamy. The potatoes weren’t super sweet, but the sugar caramelized the outer edges of the potatoes. The avocado cream sauce added a creamy freshness that offset the richness. Chickpea Tofu: Served with herb salad topped with crispy shallots and a sweet chili garlic dipping sauce. The tofu was soft and tender on the inside and crispy on the outside. I didn’t think I would like this as much as I did, but it was delicious! It was like a soft, fluffy, chickpea pillow. The crispy fried shallots added a subtle onion flavor and texture. The sweet chili garlic sauce was the right amount of sweet and heat to spice up the chickpea tofu. Drunken Pastrami: Stir-fried rice noodles with thai bail, tomatoes, chilies, black soy sauce, and gai lan (Chinese broccoli). This was my first choice, but it ended up being super spicy! The pastrami was tender and delicious, but the chilies really took over this dish. I really liked the rice noodles and gai lan. Pair with sticky rice to tone down the heat. Phat Mama: Stir-fried ramen, sea urchin, cherry tomatoes, chilies, thai basil, steelhead roe, and galangal (root spice similar to ginger). One of my favorites! I was very intimidated by the sea urchin, but it melted into the dish acting like a creamy sauce. The ramen was perfectly tender and delicious. The chilies added a slight kick and Watch out! I wasn’t looking and accidently swallowed one and it lit my tongue on fire. Panaeng Curry: Kabocha squash, tofu, lime leaf, peanuts, roti (Indian flatbread). My favorite dish! Most curry’s are too sweet for my liking, but this was the perfect trio of sweet, spicy, and curry. The curry wasn’t overpowering and the sauce was the perfect velvety consistency. The tofu was slightly crispy and absorbed the delicious sauce like a sponge. The squash was creamy and perfectly cooked. The peanuts added texture and the toasted roti was the ideal tool to scoop up the sauce. Scallop Sour Curry: Jasmine rice cake, napa cabbage, long beans, thai basil, cured egg yolk. The rice cake was crispy and paired well with the rich broth sauce. The scallops were tender, light, and perfect with the sour curry. I like that this dish was served with long beans, they added a nice brightness. Tom Yum Hotpot: Hot & sour soup, pork & shrimp dumplings, lemongrass, lime leaf, lime, cilantro. This was unlike any hot & sour soup I have tasted before. The broth had a good flavor, but the hot/sour element was subtle. The pork & shrimp dumplings were slightly sweet and tender. Flank Steak & Mushrooms: Wild hedgehog mushrooms, king trumpet mushrooms (high quality longer mushrooms), puya (botanical plant), lemongrass, lime, herbs. I loved the meaty, earthy array of mushrooms. The steak wasn’t as tender as I’d like, but it was sliced thin, cooked medium, and delicious. Superman Ice Cream: House made blue moon with almond crumb. The best way to end an amazing meal! You could really taste the homemade quality. Creamy, sweet, with that blue moon fruity flavor that I love. The almond crumb was subtle, but added a sweet, nutty crunch. Service was great from the moment we walked in and our server did an excellent job of explaining the menu and suggesting different dishes. Each bite was packed with a punch of flavor yet perfectly balanced. I have never tasted such a wide variety of different spices in one sitting before and it was incredibly pleasing. It pains me to report that early Friday morning, February 17, 2017, Katoi was victim to a devastating arson fire. This breaks my heart as I was just there the night before and so excited to return. Please support the owners and staff of Katoi and help out in any way that is needed. I am confident that when the mothership lands again, it will come back bigger and better than ever!